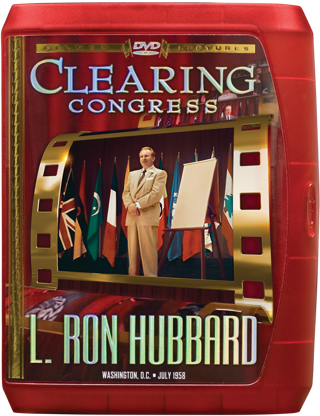 At the famed Clearing Congress, six of L. Ron Hubbard’s nine lectures were filmed. And although those original films are now nearly half a century old, through special digital techniques they have been restored to their original quality (and beyond). Each DVD and the Master Directory contains a comprehensive menu to locate specific datums and subjects. A complete glossary provides the definitions of specialized words, plus Dianetics and Scientology terms. The Master Directory includes Mr. Hubbard’s handwritten charts, issues, scales and codes referred to in the films, as well as issues from the time period. The Master Directory also includes photographs from the Congress activities at Washington, DC’s Shoreham Hotel, giving the flavor and atmosphere surrounding the original event. The Clearing Congress is the only Congress ever put on film and stands as a jubilant victory in the history of Scientology—all in living color. It was the spring of 1958 and there was one word spreading like a tidal wave across the Scientology world: CLEAR. Yet the accomplishment they were talking about was far more profound than the first individual attainment of that state. Factually, L. Ron Hubbard had been making Clears beginning in 1947 and right through 1949, prior to the release of Dianetics: The Modern Science of Mental Health. Indeed, the entire purpose of Book One was to make the breakthroughs and technology broadly available so that others could do the same. Yet while Mr. Hubbard continued to make Clears through his own personal auditing of others, the same could not be said for others. That is why, for eight solid years, he continually refined processes. Yes, he did so to provide greater workability with processes that reached deeper with faster gains for preclears. But he also was working to develop processes which other auditors could apply with success. In consequence, fully half of his research had been devoted to training. While that research story was one of steady advance, the breakthrough came in 1957 with the development of auditor training drills (TRs) which, quite literally, revolutionized auditor training (Freedom Congress). “In December of 1957 the first Clear was made by another than myself. “This was the gain. This was the fruit of the years. “Now we can have many Clears. We can have thousands of Clears. And if we can have that, we can have a civilization. “So this was the bottleneck—other auditors couldn’t really clear people. And this bottleneck is splintered to diamond bits. 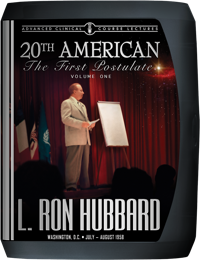 It was a period of mounting anticipation through the first six months of 1958, with Scientologists reading articles entitled “The Attainment of Clears,” “How to Test for ‘CLEAR’” and “Learning How to Clear.” But contained therein lies an even more dramatic story. For while every Scientologist can look back with reverence to that first historic moment of accomplishment, the more epic tale is contained in all else 1958 brought that is Scientology today. The final component—in addition to those training drills—with which Mr. Hubbard trained those auditors and which is the integral tool of every auditing session today? The development, manufacture and use of the first Hubbard Electrometer (E-Meter). The “magic button” he discovered and provided to those auditors, to put people in session who formerly weren’t vaguely auditable, which splits valences, heals psychosomatic illnesses, moves ridges out of heads and exteriorizes preclears? In fact, one which not only opens cases on the First Dynamic, but which is the watchword of Scientologists that makes possible planetary clearing? HELP. And all of it contained in the full anatomy of the Prerequisites of Auditing—from present time problems to ARC breaks, to the Factors of Clear—thetan, mind, body and universes, to the full description of the Freedom of Clear. Then again, as for the permanence of that accomplishment, there was something else every Scientologist recognizes today: L. Ron Hubbard’s personal design and manufacture of the first Clear bracelet. Which also explains why that very definition of Clear was emblazoned on the placard outside the Shoreham Hotel’s West Ballroom…and why, by the time it started, more than a few lucky hotel guests, attracted by that placard, had signed up and were in attendance for a Congress unlike any other. And so it was, in July of 1958—lights flooding the room, cameras rolling with color—that he stepped to the stage with The Fact of Clearing. 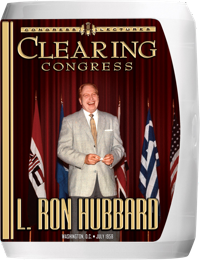 For while L. Ron Hubbard would continue to work for more than a quarter century to make it easier and faster for every being to reach that long sought goal, here is the legendary Congress where Clear became a first reality, the moment of achievement immortalized.